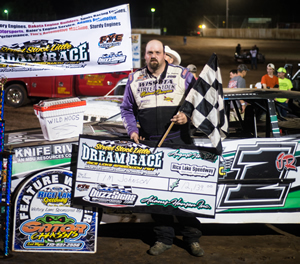 Rice Lake WI, July 31 – Danny Richards made the winning pass on Eric Olson with nine laps to go and then held on through two tense late race yellow flag restarts to win the twenty fourth annual Street Stock “Little Dream” race Tuesday night at the Rice Lake Speedway. Richards, who last won a feature race at Rice Lake in 2008, earned an event record $16,088 for his thirty five lap triumph as fans and local businesses once again came through to support the event and contribute to the purse, making it a record breaking event. Sixty drivers from five states and Canada signed in to try and qualify for the Street Stock feature and after two sets of heat races, Olson started on the pole, having earned the highest number of passing points. However, it was rookie driver Dustin Doughty who got a good jump at the start and led the opening lap for the twenty six drivers that took the green. Olson then pulled up beside Doughty and they raced side by side before Olson claimed the top spot. Ryan Satter was on the move as he pulled in to challenge the leaders while Richards, who started sixth on the grid, was also moving up. The first yellow waved with seven laps complete for a spinning Cody Kummer and after racing resumed, Olson continued to show the way with Satter working his way into second past Doughty and then going after leader Olson. However, the next eighteen laps of the race ran under the green and Olson was able to extend his lead to nearly a full straightaway over Satter while Richards moved into second with Jimmy Randall also advancing up to fourth after starting ninth of the field. At the half way point of the race, Olson continued to maintain a comfortable lead over Satter, Richards, Randall and Doughty. Randall and Satter made contact while battling for the third spot and while they both were able to keep running, Satter slipped high and lost several positions. They continued to run in that order until a spinning Mike Knudtson triggered the yellow flag once again and set up a ten lap sprint to the checkered. However, at this point the whole complexion of the race changed as on the green, Olson pushed up the track and lost just enough momentum that Richards was able to drive around him and take over the top spot, thus forcing Olson to chase rather than controlling the lead that he had held for a number of laps. The intensity level picked up as the laps ran down with two late yellow with three and two laps to go respectively, slowing and bunching the field. One of the yellows was for debris on the track and one for a spinning Tim Johnson as the former “Little Dream” winner would not repeat. On the green following each of the last two yellows, Richards rode the high side into turn one and both times Olson passed him for the lead, only to see the yellow wave twice and save him from losing the top spot. Finally, the field was able to complete the last two laps and on the final restart, this time Richards drove the low line through turn one and held off the charging Olson. Randall was also pushing hard and he was able to edge past Olson to take over the second spot. The final tour saw Richards able to maintain his lead with a smooth final lap and while Randall gave it a shot, he came up a car length short as Richards drove on to the record breaking win. Olson finished a close third and reported that a tight race car was his downfall at the end of the race with Sam Fankhauser, up from fifteenth to fourth and Doughty rounding out the top five. 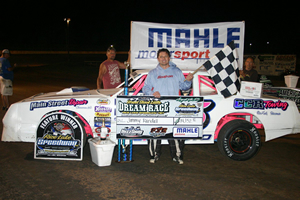 The second five consisted of Jason Havel, Satter, Jeff Crouse, who earned the Hard Charger award after starting twenty second, Hunter VanGilder and Brett Miller as nineteen drivers completed the distance, all on the lead lap. Olson turned the fastest lap of the race with a time of 18,171 seconds while heat race wins went to Doughty, Kummer, Kyle Dykhoff, Randall, Jay Kesan, Kolby Kiehl, Kark Genett, VanGilder, Keith Tourville and Knudtson while Olson was the only double heat race winner. Brian Johanson won the “Long Haul” award after towing from Edmore North Dakota for the race. Current national point leader in the WISSOTA Street Stocks, Justin Vogel, won the Non Qualifiers Feature and opted to pass on the money and instead, start at the back of the main event. He was scored twentieth in the final running order after spinning on the last lap of the feature race. 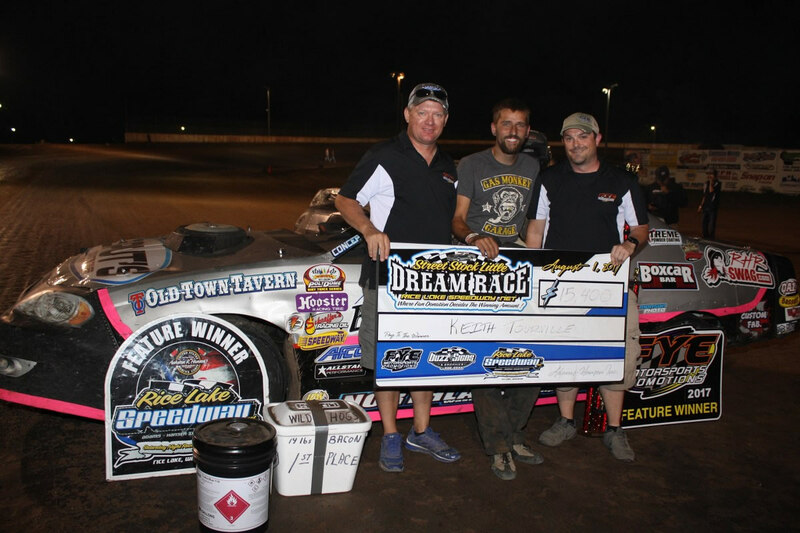 The Midwest Modifieds were also on the card and Kevin Adams led all twenty laps of that race to earn his fourth feature win of the year at the track. He started on the pole, got the early jump on Alex Williamson and then pulled away from the field. Williamson ran a strong second for much of the first half of the race before being overtaken by Joe Chaplin Jr for the spot. The Midwest Modifieds were flying around the track as they used at least three grooves and there was much passing and repassing going on in the pack. Two yellows slowed the first half of the field with Scott Bintz riding over a tire on another car and breaking his steering and then a tougher crash when current track point leader Austin Ellis spun in heavy traffic and got drilled by Aric Lindberg and Gunner Peterson with all three cars retired for the event. The last thirteen laps of the race ran off nonstop and Adams was cruising on the high side as he pulled away from the pack. The most impressive drive of the late going saw Calvin Iverson move up from his third row starting spot as he got his car to work right on the low side of the track and he was able to drive past Williamson, defending national champion Sketter Estey and on the final couple of laps, Chaplin Jr to take over second and record an impressive finish for last year's national rookie of the year. On a beautiful night for racing in northern Wisconsin, a spectacular crowd was on hand that helped build the purse into a record breaking one once again. The speedway will now take this Saturday night, August 4th off so that fans and track officials can rest up for the frantic final few weeks of the regular season. Racing will resume on Saturday night, August 11th with Hall of Fame night that will see Tom Nesbitt, Todd Madsen, Rod Hensel and Dave Greschner inducted into the Rice Lake Speedway Hall of Fame. It will also be the Race of Champions qualifiers for the ROC race to be held during the WISSOTA 100 at the I-94 Speedway in Fergus Falls Minnesota. This race was rained out on June 16th with the feature winners guaranteed starting spots in the ROC race during the “100.” The draw/redraw qualifying format will be in effect and all five classes that race at the speedway on a weekly basis will be in attendance. Warmups begin at 6:30 pm with racing to follow. Check the speedway website at www.ricelakespeedway.net or the face book page of the track for more details. 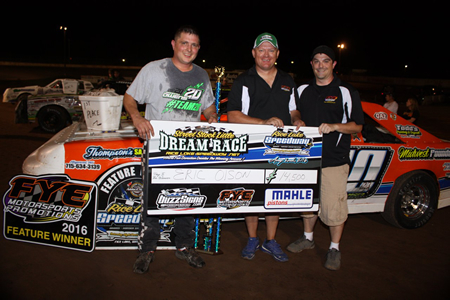 Rice Lake WI, August 1 – Passing two time winner of the Street Stock “Little Dream” race Tim Johnson with just over a lap to go, Keith Tourville won his first ever “Little Dream” on a record breaking night for the event. The twenty third annual running of this nationally known and unique event saw records shattered once again. This race, which is unique in that businesses and individuals contribute money to built up the purse, saw Tourville go home with a record top prize for the event. The thirty lap Street Stock feature race paid an impressive $15,400 to win with most of the other finishing positions also enhanced thanks to contributions from the crowd. 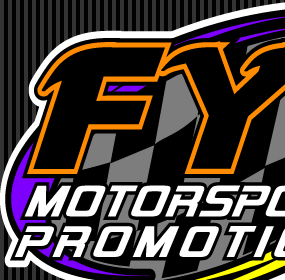 This year's race, sanctioned once again by WISSOTA, and administered by FYE Motorsports Promotions, drew fifty seven entrants from four states and Canada and was the second highest number of competitors ever for the event. The companion Midwest Modified main event was won by Joe Chaplin Jr.
Twenty five drivers took the green flag for the Street Stock main event with Eric Olson getting the jump on Johnson to take the early lead. Johnson and Jim Gullikson were the main challengers to Olson in the early going with the leaders running three wide on several occasions. Both Johnson and Gullikson came close to taking over the lead on different occasions only to have Olson fight them off. The race was slowed several times in the first fifteen laps of the event by several minor spins that kept the field bunched. Behind the top three in the running order, Sam Fankhauser, Tommy Richards, Ron Hanestad and Jeff Crouse were running in close formation while Tourville rolled along consistently in the top five but not challenging the leaders at this point. The yellow flew for a slowing Jordan Tollakson at the halfway point of the race with Olson still maintaining a tight lead over Johnson and Gullikson. Tourville had advantage to fourth by this point with Fankhauser, Crouse and Kyle Genett now joining the leaders. Back on the green, Johnson made his move on the outside and was able to drive past Olson to take over the lead with Gullikson following suit a few laps later to take over second. Gullikson then began to challenge hard for the top spot as he several times nosed up beside Johnson, only to have Tim fight him off once again. Things got very crazy starting at about lap twenty five with the yellow waving four times without a lap being scored. The leader Johnson was turned around twice in turn four as the battle for the top spot got very heated. Both times Johnson was restored to the top spot and both Olson and Gullikson were penalized to the back of the pack for instigating the contact that sent the leader spinning. Tourville had kept his nose clean and with the shuffling of the leaders, he now found himself running in second spot and with an open track ahead of him. On the final restart, he jumped to the outside and immediately found success as he was able to edge up on the leader and soon they were nearly door handle to door handle. Tourville continued to apply heavy pressure while continuing to use the second lane on the track and as the white flag appeared, Keith was able to clear Johnson and claim the lead. Johnson came back hard on the final circuit, throwing his car hard into turn four but Tourville maintained his line and beat Johnson to the finish line by a car length for the stunning and surprising upset win. Kolby Kiehl had gradually worked his way to the front and then really gained ground the final five laps as he came from fifteenth to finish a strong third with Fankhauser and Karl Genett completing the top five. Scored sixth through tenth were Justin Vogel, Hunter VanGilder, Jimmy Randall, Charlie Shiek and Danny Richards. Despite the multitude of yellow flags(eleven slow downs in all), twenty one of the twenty five starters were still on the track at the finish with all on the lead lap. Perhaps the most stunning fact of all was the fact that Tourville was driving the winning car for the very first time, having finalized a deal just Tuesday morning to drive a car for the Blowers Racing Team out of Waseca Minnesota. Tourville drove as a second driver to Mike Blowers, driving the car normally raced by Blowers' son Bobby, a rookie in the class. However, Tourville's business, Player Motorsports, did build both of the Blowers' cars. Tourville celebrated his win with a smoky “burndown” on the front chute of the track as the large crowd on hand applauded the winner and the winning team celebrated their triumph. 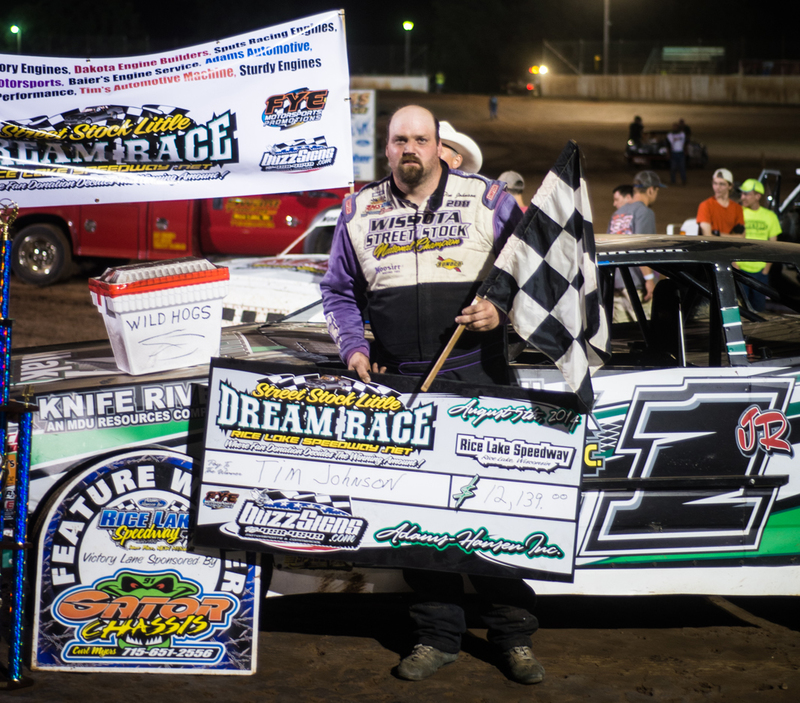 The Midwest Modified main event saw Aric Lindberg lead the first half of the race as he tried to win his third feature race of the year at Rice Lake. He was being closely pursued by Joe Chaplin Jr, Jeffrey Lien Jr and Shane Halopka. Michael Truscott was also on the move, as he charged up from the fourth row and looked to be ready to challenge for the lead. A yellow slowed his momentum however, and Chaplin Jr used the restart to make a still challenge for the lead. He dove low into turn one and was able to get under the leader and take over the top spot. Truscott moved into second and tried his best to catch the leader, but Chaplin Jr had a good clean line on the track and he drove home for the win with Truscott several car lengths behind at the finish. Halopka finished a close third with Lien Jr and Lindberg rounding out the top five. There will be no racing at the speedway this coming Saturday, August 5th. Racing will resume on August 12th with a full five division program. It will also be Hall of Fame night with six new members slated to join the Rice Lake Speedway Hall of Fame including Clayton Hargrave, Joe Lapcinski, Terry Foltz, Jim Rude, Paul Harelstad and the late Duane Mahder. As usual, warmups start at 6:30 pm with racing at 7 pm. Rice Lake WI, August 4 – The 2014 version of the Street Stock “Little Dream” race at the Rice Lake Speedway was so spectacular that everyone wondered if this year's version of the race could maintain the high standards that this race has set. They shouldn't have been concerned. Tuesday night, Jimmy “The Blade” Randall topped a record field of sixty four Street Stock competitors from four states and two Canadian Provinces and in the process, due to tremendous contributions from fans and race supporting businesses, Randall went home with a check for $14,152.12, smashing last year's record payoff by over $2,000 and setting what is believed to be a national record first place prize for the Street Stock type of race car. The event was sponsored by Mahle Motorsports, BuzzSigns.com and FYE Motorsports Promotions. Randall, a local driver from Rice Lake, fought tooth and nail with defending “Little Dream” and current WISSOTA national Street Stock point leader Tim Johnson, making the winning pass with only three laps left in a race that saw the top spot swapped officially three times in the last ten laps of the race. Randall edged Johnson by a car length at the line while third place finisher Jordan Tollakson came from thirteenth to finish another car length behind at the finish. 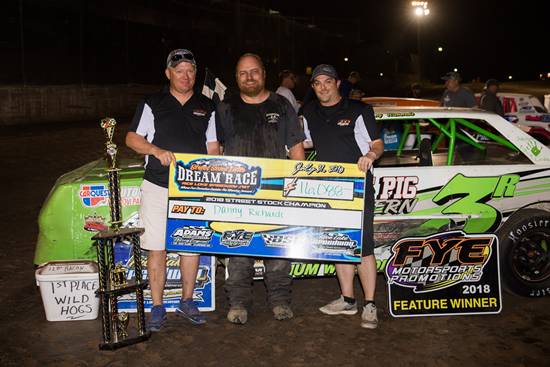 The WISSOTA Modifieds were also on the card on Tuesday night's program and current Modified national point leader Kevin Adams fought off a hard challenge from Kevin Eder and Jason Gross to record the feature win in that class. Twenty seven of the sixty four Street Stocks on hand took the green flag for the thirty lap main event. Randall, who started on the outside pole, raced side by side with another Rice Lake driver, Kori Richter in the early going. While Randall was scored the leader of the first sixteen laps, most of those laps saw Richter either right beside him or, at worst, riding his rear bumper. Right behind the lead duo, Adam Soltis battled with a charging Jim Gullikson, who had quickly moved up from the fifth row, along with Mike Blowers and Travis Krause. Meanwhile, Johnson was also on the move as he started twelfth on the grid but quickly moved to the low groove and started his charge to the front, with Tollakson, who started just behind Johnson, following suit. As Randall continued to show the way, with Richter challenging him on every lap, Johnson showed his strength as he worked his way up to third, and by lap fifteen, had caught the leaders. A three car collision on lap sixteen slowed the action, and on the double file restart, Johnson moved up the track and pulled up beside Randall as the green dropped. Jimmy appeared to be having some problems getting through the corners as he car began to slip off the bottom and Richter looked to get inside of him. As they raced down the back chute following the yellow, Richter dove to the inside of Randall while Johnson went to his high side and they raced into turn three, three wide. However, Richter couldn't hold his car down in the low groove and he slid up, clipping both Randall and Johnson and sending then spinning, which caused the field to scramble and triggered the yellow once again. Richter was sent to the tail for the restart and Johnson inherited the lead. Two more quick yellows slowed the action again but then everyone settled down and the last thirteen laps of the race went green. Johnson moved to the point and led the next three laps while Randall and Tollakson battled for second. The double file restart forced Randall to the outside and he found traction in the second lane. He pulled back up beside Johnson and the leaders ran side by side, battling for the top spot. Randall fought his way past Johnson and led laps twenty one and twenty two by inches, only to see Johnson fight his way back into the top spot and lead the next four laps. Randall was slipping just a bit in the corners as he fell back by nearly a car length but once again Randall made an adjustment as he moved slightly lower on the track and adjusted his entry line to the corners. This worked as once again he clawed his way back up beside Johnson, who was running on the tires on the inside of the track. With two laps to go, Randall once again edged into the lead and as Johnson pushed into turn one, his car slid up the track just enough that Randall was finally able to clear him. The white flag found the top three running nose to tail and while both Johnson and Tollakson gave it their best shot, Randall kept the middle groove working and he drove home to take the win by a car length with Johnson and Tollakson in tow as the massive crowd let out a thunderous roar. Krause, who had fallen back several position during the mid portion of the race, made a strong charge following the last yellow and also working the high side, raced his way past Gullikson to take fourth at the finish. The second five at the line consisted of Sam Fankhauser, Kevin Bogdanovic, Mike Knudtson who started twentieth, Ryan Pommerer and Kolby Kiehl, who started twenty fourth. 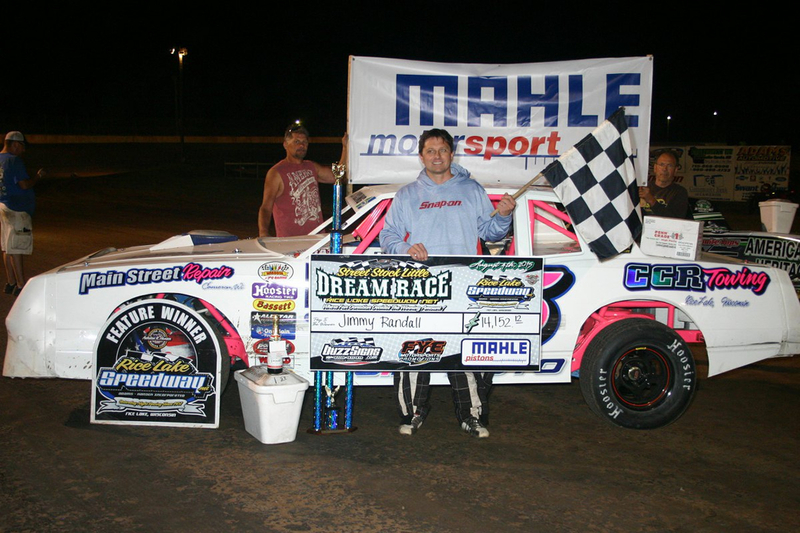 Randall, who won his second “Little Dream”, previously having won the event in 2012, has now taken over $20,000 out of the Rice Lake Speedway with his two wins in this race. Eight heat races set the grid for the main event using passing points along with three B features that completed the starting field. The non qualifiers race went to Aaron Johnson who opted to forfeit the $500 first place prize and instead start at the tail of the main event. He ended up fifteenth in the thirty lap main event. Adams started on the outside pole for the Modified main event and led every lap, although things got tight for the leader following a couple of late race yellows. The first twenty two laps of the race went nonstop and Adams, working the high side of the track, had pulled out to a ten car length lead over Eder and Jason Gross. Gross picked up the pace near the midpoint of the event and moved past Eder to take over second and appeared to be cutting into Adams' lead to some degree. Meanwhile, the duo of Jake Hartung, defending champion of this event, and Johnson, who was doing double duty running both Street Stocks and Modifieds, were on the move. A spin on the front chute slowed the action and on the green, Eder picked up the pace and was able to drive back around Gross and take over second spot. Adams briefly tried the low groove but when Eder got right to his rear bumper, Adams again moved back up the track and started to extend his lead. One move yellow slowed the action with only three laps to go. This time Adams pulled away from the field and extended his advantage while Hartung drove past Gross for third and tried to pressure Eder for the runner up slot. Adams continued to roll on and he drove under the line for the win, unchallenged at the end. Eder fought off a hard challenge by Hartung for second with Gross and Johnson completing the top five. Racing action continues at the Rice Lake Speedway on Saturday, August 8th. A five division program will see warm ups begin at 6:30 p.m with racing to follow. At intermission, bike races will be held with divisions for both the kids and adults. Check the speedway face book page for more updates on the racing schedule for the rest of 2015. Rice Lake WI, August 5 – The twentieth annual renewal of the Street Stock “Little Dream” race Tuesday night at the Rice Lake Speedway smashed all records for this event. This unique event, in which the purse the drivers’ race for is largely funded by fan contributions, set all kinds of new records Tuesday.